Are you looking to build iron-clad self defense skills while getting into the best shape of your life? You can expect all of that and more with the Jiu Jitsu classes at Radius Martial Arts in Fairfield! We are the only 10th Planet school in New England and greater NYC area! Brazilian Jiu Jitsu is predominantly fought with both opponents on the mat working to achieve dominant positioning and to ultimately submit their opponent using joint-lock and choke techniques. Because most fights end on the ground, it is a huge advantage to be trained in how to dominate in these circumstances. 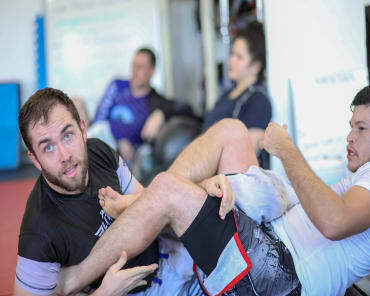 Brazilian Jiu Jitsu focuses on leverage and proper technique and is well-suited for teaching a smaller person how to defend himself against a larger adversary. At Radius Martial Arts, our trainers customize each Gi and No-Gi lesson so that you can be sure to achieve each goal you set. Our program is designed to increase your core strength, flexibility and stamina while you attain practical self-defense techniques. Why Learn Brazilian Jiu Jitsu? Take Action! Get Quality BJJ Training Today! We offer Brazilian Jiu Jitsu classes for adults of all skill levels. Improve your level of fitness. Learn something new. Connect with some amazing people. Leave the outside world behind the big red doors of the studio and find your respite working hard, training hard, and growing your game, your strength, and your spirit. Part of the American Top Team CT/Kore Martial Arts affiliation WE ARE RADIUS Martial Arts Academy/ 10th Planet Fairfield and we welcome you to come over and try us out! GET STARTED TODAY by simply filling out the form on the side of this page! Interested in finding out more about the other Adult Martial Arts classes we offer? Click here.